"Remember the words of my father and my grandfather, your duke. They spoke to you of desert power. I am desert power and nothing can stop what is going to happen." Few book series are as epic, eternal, and so thoroughly fan-based as Frank Herbert's Dune books. Attempts to create film versions of his books has been something of an on-going war between filmmakers and the very material they want to represent on screen. While most remember the 1984 version of the first book directed by David Lynch, there had been earlier attempts to render the book cinematically, most noteworthy of which was by director Alejandro Jorodowski. Another attempt was made in 2001 when writer/director John Harrison put together his own Dune television mini-series which, in director's cut format, runs a whopping 5+ hours. And that's just for one book. 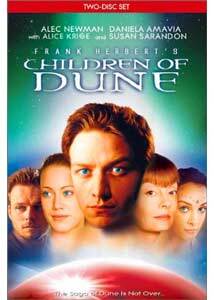 His vision was to create mini-series version of the entire Dune saga in accordance with Frank Herbert's novels. Now we have Children of Dune, an ambitious attempt to take two whole books (Dune Messiah and Children of Dune) and compress them into a four-and-a-half-hour television event. The story here continues some years after the events in Dune. Paul, called "Muad'Dib," is now the ruler of planet Arrakis, as well as much of the universe. Having ousted the Emperor from his place in the galaxy, Paul and his family now control the entirety of spice trade (the mystical substance that allows for space-travel) and have slowly introduced more water into the fragile, desert eco-system of Arrakis. Paul is unsure of what course his government should take, especially since fanatic, religious followers of his cause have already wreaked death and destruction across the universe in his name. As usual, though, his family (House Atreides) has numerous enemies all over the universe, not the least of which are House Corrino and the Bene Gesserit Motherhood, a guild of supernaturally-gifted witches who wish to manipulate politics in order to bring about their vision of a perfect universe. Some familiarity with the source novels will help viewers make better sense of this overload of characters, politics, friends, and foes, but in general, it's obvious his government is in trouble. It is Paul's realization that he can no longer fill the role of Muad'Dib the messiah that essentially drives the core of the story. He knows his rule must end one day, but he's unsure if he wants to leave what he has begun in the hands of his gifted sister, Alia, whose powerful Bene Gesserit abilities leave her at risk of going quite insane. Without going into spoilers (for those who haven't read the books), essentially this mammoth task of re-organizing Muad'Dib's original visions for the future of Arrakis must fall to Paul's children, who may very well be more powerful than he ever was, and certainly stronger. Like a futuristic Godfather, the story is basically about a multi-generational conflict between warring Houses and political factions, including a rebellion by the Fremen themselves (the indigenous population of Arrakis who feel the government is abandoning their principles). In the meantime, House Corrino conspires to attempt growing spice on another world so that Arrakis no longer has monopoly on the substance. But this can only be done by transplanting the giant sandworms of the planet and keeping them alive, a feat not easily accomplished. Right off the bat, I will state that this project (directed by Greg Yaitanes, a long-time veteran of television) is far more successful and entertaining than the first Dune mini-series. Part of this is thanks to a dramatically improved cast. While a few important actors and actresses from the original remain in their roles (especially Paul, played by Alec Newman), many other roles have been recast with far better results, perhaps the most dramatic of which is the change of the role of Stilgar (a leader of Fremen tribes and assistant to Paul) to Steven Burkoff in what is one the finest performances of his career. Also of note is actor Edward Atterton who takes over the role of Duncan Idaho (Paul's long time friend who, though killed in the first series, is reborn as a creepy, genetically re-built Mentat). One might expect Susan Sarandon to dominate the cast, but her small role doesn't really give her the chance, so the other characters are really allowed to flourish. The story flows much better in this one as well. Admittedly, the first Dune novel is the hardest and most complex to translate to film since it sets up the entire saga, but compressing two books together and still winding up with such an epic-feeling tale of intrigue is impressive. Yes, it's a very talky movie, but it has to be, really. The budget has taken a boost as well resulting in better overall special effects, set design, and bluescreen effects. This also gets rid of the slightly annoying painted cloth backdrops so often seen in the first Dune which, while a clever idea to add an artistic touch to the film, always reminded the viewer of the very small sets. I certainly look forward and hope that there the series continues with this level of quality and commitment as it will result in an effective and timeless interpretation of the classic book series. Of course, there are many complex debates on whether these made-for-TV films should also go into the newer Dune novels being written by Frank Herbert's son, Brian, which delve into the world of Arrakis before the original series began. Either way, John Harrison and Greg Yaitanes should be extremely pleased with this effective and dramatically satisfying sci-fi epic. Image Transfer Review: While the transfer gets a bit grainy at times and exhibit a little bit of pixelization (from oversharpening? ), it is still a very solid rendering of the amazing photography featured here. Vittorio Storaro is no longer the cinematographer here, but Arthur Reinhart does an amazing job. I am unsure whether this film, like the first Dune, used Storaro's new film-to-digital, 24p format negatives (which are quite revolutionary), but it looks very impressive. The bluescreen work is also much more seamless and convincing, fitting in better with the use of CGI for multiple elements. The transfer does not effect any of these elements, though, and despite a little bit of color bleed here and there, the video is sumptuous. The image is anamorphic and widescreened at 1:77:1. Audio Transfer Review: The Dolby 5.1 soundtrack is very exciting, with tons of ambient material, surround effects, and all the energy and power you'd expect from a major, theatrical release. It is truly well engineered, creating a soundfield that will not only give your home theater a little work out but make the film all that more believable. There's a lot of good bass, multiple speaker usage, and all sorts of action to ramp up the experience just when it's needed. The Dolby 2.0 is surprisingly good along these lines as well, but I suspect even on a non-5.1 system, the 5.1 would still offer better clarity and channel separation. Extras Review: A featurette is included on the development of the special effects, art design, and overall look of the film. It includes interviews with most of the main crew, including writer John Harrison, director Greg Yaitanes, and effects supervisor Ernest D. Farino. It's an interesting look at the development of the film, and features a few, key sequences from the movie shown in both their normal and storyboard formats, to showcase how closely they attempted to follow the originally scripted ideas. The disc menus are relatively well made, but I would make a small complaint about the tediously slow and annoying chapter search menus which only allow you to look at 4 chapter stops at a time, and even then, there's a short load time while an image of the chapter pops up while you try to scroll past them. Children of Dune is simply a better made film than the first Dune, resulting in a more entertaining and exciting story unaffected by problems with poorly cast actors, rushed writing, and budget issues. While there are a few elements with which I don't agree in this interpretation, I highly recommend this second project to anyone who's either seen the first one or has at least read the first book, giving them some background on the events unfolding here.